After Matthew Wantman was recently eliminated, Soukha Kachittavong was awarded the trophy after him and Je Wook Oh decided not to play out any more hands. Kachittavong was awarded the trophy and $76,057. Je Wook Oh also took home $76,057. Matthew Wantman took 107,000 after a four-way chop deal. Matthew Wantman shoved all in and was called by Soukha Kachittavong. The board ran out [js][9h][2d][8h][4d], eliminating Wantman in third place. Soukha Kachittavong shoved all in from the small blind and after a few moments of thinking about it, Je Wook Oh called. The flop came [jc][10c][7d] giving Oh the lead with his pair of tens. When the [ah] came on the turn, it was Kachittavong that took the lead. But the [kc] on the river gave Oh two pair and he doubled up to 1,700,000. Soukha Kachittavong limped in the small blind and Ryan Mostafa shoved all in from the big blind. Kachittavong thought about it for a bit saying, "I either have you dominated or you have me crushed." After another minute, Kachittavong called. The flop came [9h][2h][3d] giving Mostafa the lead with his pair of nines. But the [kh] on the turn gave Kachittavong the lead with his pair of kings. "Give me the ace," Mostafa said. "Give him the ace of hearts," Kachittavong said. And without waiting, the river came the [ah], giving Mostafa two pair, but giving Kachittavong the flush to eliminate Mostafa in 4th place. Ryan Mostafa raised to 150,000 and Je Wook Oh shoved all in. Mostafa quickly called. "Don't worry, I've got this. I'll hit my ace," Mostafa said before any cards were dealt. The flop came [6s][jd][8c] giving Oh a set of eights. The turn brougt the [8s] giving Oh quads. When the [ac] came on the river Mostafa said, "I got my ace," as the chips were passed over to Oh. Oh is now sitting with 1,400,000. Matthew Wantman raised to 85,000, Soukha Kachittavong reraised to 215,000, and Je Wook Oh four-bet to 500,000. Wantman folded, Kachittavong shoved all in, and Oh called. The board ran out [7c][2h][2d][3h][3s] awarding Kachittavong a full double to 1,800,000. 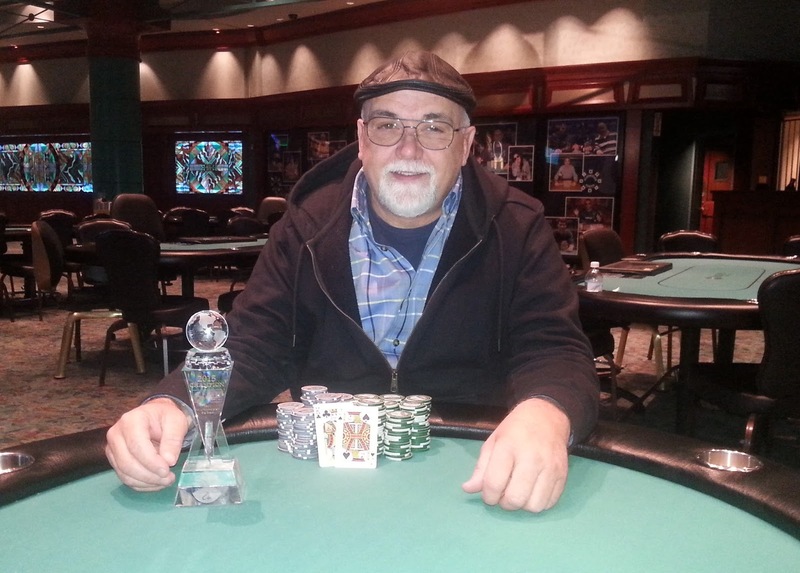 They are leaving $12,000 on the table and playing for the remaining cash and the trophy. The remaining four players are currently negotiating a chop deal. After the details are worked out, they will head out on a 60 minute dinner break. Details of the chop will be posted as soon as they are available. On a board reading [jc][7s][5h][10s][8h], Rob Campion shoved all in and was called by Matthew Wantman. Campion showed pocket nines for a straight but Wantman turned over [qc][9c] for the higher straight. "Only hand I can't beat," said Campion as he gathered his belongings and headed towards the payout desk. Wantman is now the chip leader holding 3,750,000. Soukha Kachittavong shoved all in from the small blind and Ryan Mostafa quickly called in the big blind. The board ran out [ad][10s][7d][9c][3h]. Mostafa is now sitting with 900,000, and Kachittavong with 1,500,000. Matthew Wantman made it 65,000 under the gun. Je Wook Oh called in the small blind and Rob Campion called in the big blind. Campion and Oh checked the [8h][4s][3h] flop, and Wantman continued for 70,000. Only Oh called. Oh checked-called the [5c] turn when Wantman bet 165,000. Oh checked the [5d] river and Wantman bet 385,000. Oh thought for a moment before he released his hand. Wantman is now sitting with 2,200,000, and Oh with 700,000. Evan Paushter shoved all in and was called by Je Wook Oh. "You don't have kings again do you?" Paushter asked Oh. Oh turned over [kh][kd]. Paushter sighed and turned over [9h][9d]. The board ran out [qh][10d][4c][10s][5c] sending Paushter home in 6th place. Matthew Wantman got it all in preflop and was called by Je Wook Oh. "You don't have aces do you," Oh asked as he turned over [kd][kc]. The board ran out [8c][4c][4h][4s][ah]. Wantman doubled up to about 1,750,000. Oh is now sitting with 1,800,000. Peter Sennon shoved all in and was called by Soukha Kachittavong. The board ran out [qc][10c][7h][qs][qd] sending Sennon home in 7th place. On a board reading [8s][5h][ac][7d][2s], Charles Hawkins shoved all and Je Wook Oh alled. "Jack ten," Hawkins said as he turned over [jc][10d]. Oh showed [as][js] to win the hand with his pair of aces. "It's just didn't make sense, that's why I called," Oh said to the table. Oh is now sitting with nearly 3,000,000 in chips. There were a total of 126 runners in Event #21, the final event of the World Poker Finals series here at Foxwoods. Steven Tabb shoved all in from the cutoff, and Soukha Kachittavong re-shoved for more in the small blind. Ryan Mostafa folded his big blind. "One time," Tabb said as he turned over [qd][10h]. Kachittavong showed [ac][ks]. The flop came [ah][6d][5s] giving Kachittavong the lead. When the [as] came on the turn it was over for Tabb and the [8d] river became inconsequential. Kachittavong is now sitting with 1,220,000. After losing a big hand the previous hand, Peter Sennon shoved all in for 69,000 from the small blind after Robert Campion had opened to 60,000 from under the gun. Je Wook Oh called in the big blind as did Campion. Oh and Campion checked it down as the board ran out [qc][7d][3d][6s][8h]. Campion turned over [ad][8d] for a pair of eights. But Sennon showed [qs][9h] for a pair of queens, and Oh mucked his hand. Ryan Mostafa raised to 40,000 in the small blind, Peter Sennon shoved all in from the big blind and Mostafa called. The board ran out [10c][jh][kd][3s][6s] awarding Mostafa a full double to 550,000. Sennon was left with 70,000. Rob Campion raised to 50,000 in the hijack. Evan Paushter shoved all in for 355,000 from the cutoff. Steven Tabb re-shoved over the top on the button and all other players folded. Tabb was in the leading holding [ac][ks] against Paushter's [ah][jh]. The flop came [5d][6d][7s]. The turn paired the board when the [7c] hit. But the [js] on the river gave Paushter two pair and he was awarded a full double. Tabb is now sitting with 250,000. Jennifer Mumby shoved all in on the button. Je Wook Oh asked for a count and when he heard the 99,000 total, he called. Oh's pair of sevens remained in the lead when the flop came [jc][5c][2h]. Mumby turned an open-ended straight when the [10h] came on the turn. But the [kd] on the river did not improve her hand and she was eliminated in 10th place. 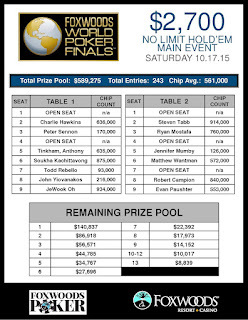 Players have just redrawn for seats and the final table of ten is set. We will bring you updated chip counts as soon as they are available. Play will resume in 15 minutes. On a board reading [jd][7c]][2h][10s], Todd Rebello shoved all in and Je Wook Oh quickly called. Rebello turned over [kc][ks], but Oh had flopped a set of sevens holding [7s][7h]. The [3s] river did not help Rebello and he was sent home in 11th place. 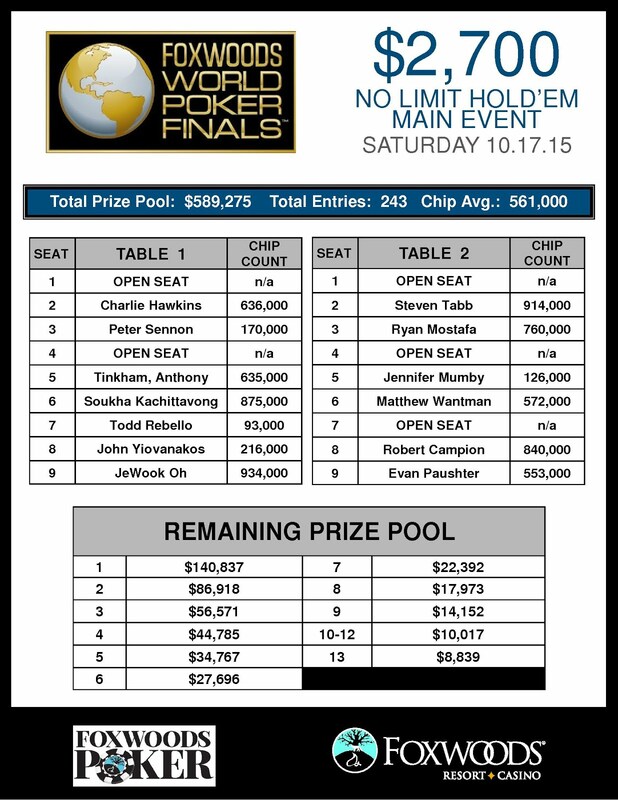 Charlie Hawkins raised to 35,000, John Yiovanakos shoved all in from the small blind and Hawkins quickly called. The board ran out [7s][3s][3d][5c][qd], eliminating Yiovanakos in 12th place. Matthew Wantman made it 26,000 from under the gun, Rob Campion raised to 60,000, and Wantman called. The flop came [8s][6d][5s]. Wantman checked, Campion bet 100,000, Wantman raised to 220,000, and Campion called. Wantman shoved all in when the turn came the [7c]. Campion went into the tank for over four minutes. He shifted back and forth in his seat and after minutes of tanking, he folded [10h][10c] face up. Campion is now sitting with 470,000, and Wantman with just under 1,000,000. Je Wook Oh raised preflop to 27,000, Anthony Tinkham reraised to 65,000, and Oh called. The flop came [ah][10s][9d]. Timkham led for 100,000 and Oh called. When the turn fell the [8d], Timkham shoved all in and Oh snap-called. Oh turned over [qc][jd] for the straight, and Tinkham showed [as][ks] for a flopped pair of aces. The [kd] on the river ensured Tinkham's elimination in 13th place. Oh is now sitting with nearly 1,500,000. A full schedule for the World Poker Finals series is available here.